New study showed relief from current dry spell in the Middle East unlikely within next 10,000 years. MIAMI (July 11, 2017)—The results, which include information during the last glacial and interglacial periods, showed that relief from the current dry spell across the interior of the Middle East is unlikely within the next 10,000 years. Stalagmites are calcium carbonate deposits that slowly grow on cave floors and, under the right circumstances, record changes in the climate outside the cave in their chemical composition. The researchers found that climate during the last 70 to 130 thousand years, including during the last interglacial as recorded in the interior of the Middle East, is closely linked to the climate of the North Atlantic region. By comparing their findings with others, they saw a close connection between water availability and enhanced solar insolation across the mid-latitudes of Eurasia. The study showed that solar insolation is not returning to high values relative to today until another 10,000 years from now. The researchers determined the depositional age of the two stalagmites, collected in Qal’e Kord Cave in central northern Iran, using a technique called uranium-thorium geochronometry conducted in the UM Rosenstiel School’s Neptune Isotope Lab. The paleoclimate data, which included mainly changes in the oxygen isotopes of the calcium carbonate deposits, were then compared to similar records from other caves, ice cores, and sediment records as well as model predictions for water availability in the Middle East and west central Asia today and into the future. 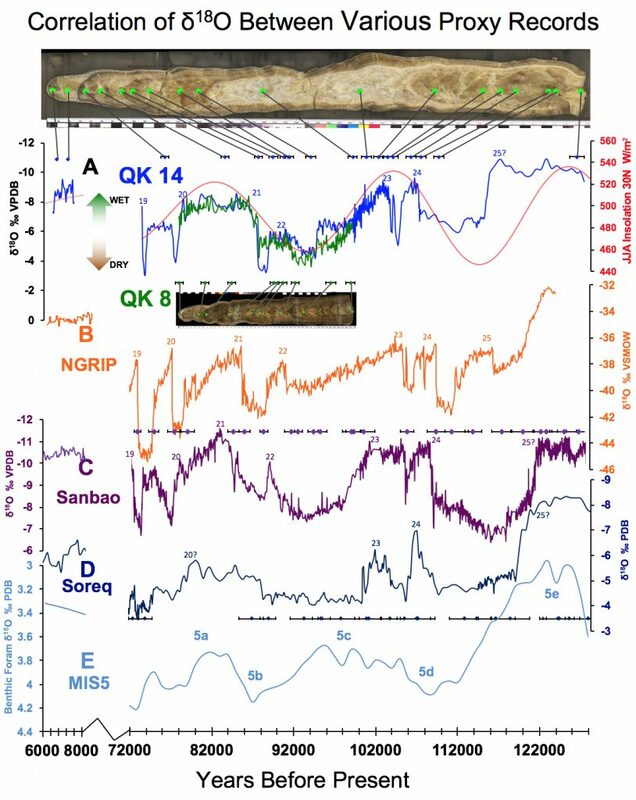 The study, titled “Speleothem records of glacial/interglacial climate from Iran forewarn of future Water Availability in the interior of the Middle East,” was published May 15 in the journal Quaternary Science Reviews. DOI:10.1016/j.quascirev.2017.03.028. The study’s authors include: Mehterian, Pourmand, Arash Sharifi, and Peter Swart from the UM Rosenstiel School; and Hamid Lahijani and Majid Naderi from the Iranian National Institute for Oceanography and Atmospheric Science in Tehran. National Science Foundation grants AGS-1103489 and EAR-1003639 provided funding for the study. Graphs showing data measured from two stalagmites from QK Cave in Iran in comparison with other proxy records. A: Blue line is δ18Oc from QK14 and green line is QK8. Both are from the same came but ~75m apart from one another. Primary driver for long scale climate change is orbital configuration. Colored diamonds represent U-Th age tie points with their associated error bars. B: Orange line is δ18Ow measured in the NGRIP ice core. C: Purple line is δ18Oc measured in Sanbao Cave, China, part of the Hulu Cave record (Wang et al., 2008). D: Dark blue line is δ18Oc measured in Soreq Cave, Israel (Bar-Matthews et al., 2003). E: Light blue line is δ18Oc measured in foraminifera collected from deep sea sediment cores (Lisiecki et al., 2005).